Did you buy Maximum Strength Robitussin DM? Pfizer sold and marketed to consumers an over-the-counter medication known as Maximum Strength Robitussin Cough+Chest Congestion DM, containing two active ingredients which act as a cough suppressant (Dextromethorphan HBr) and an expectorant (Guaifenesin). Pfizer has duped consumers into paying more for a product that has less medicine in it per 10ml, all branded under the false name of "Maximum Strength." 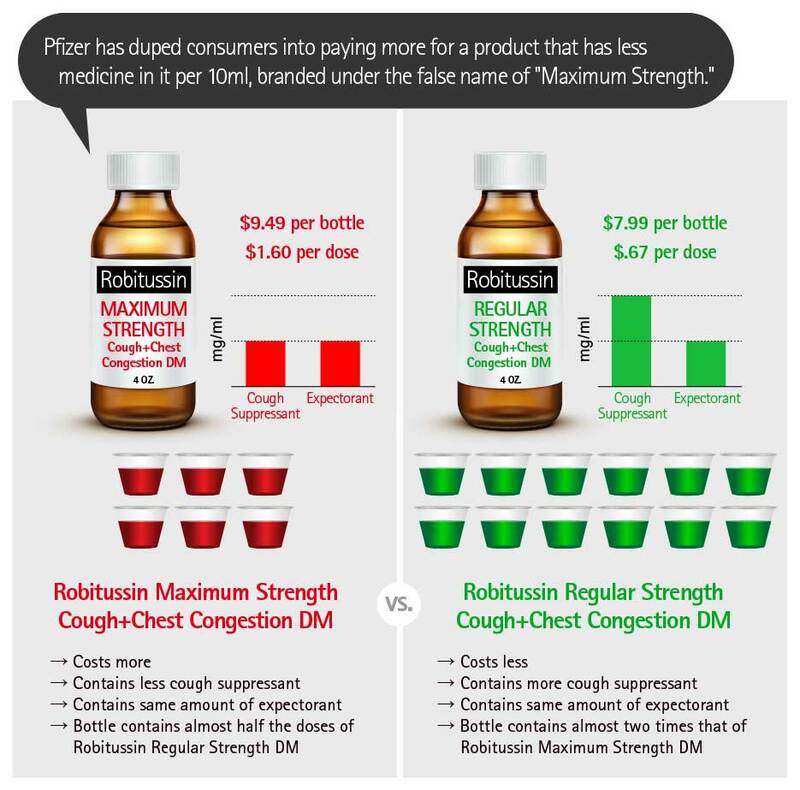 Despite the fact that Maximum Strength Robitussin is typically more expensive than regular strength Robitussin Cough+Chest Congestion DM, Maximum Strength Robitussin contains half the amount of cough suppressant per 10 ml and the same amount of expectorant per 10 ml as Regular Strength Robitussin. 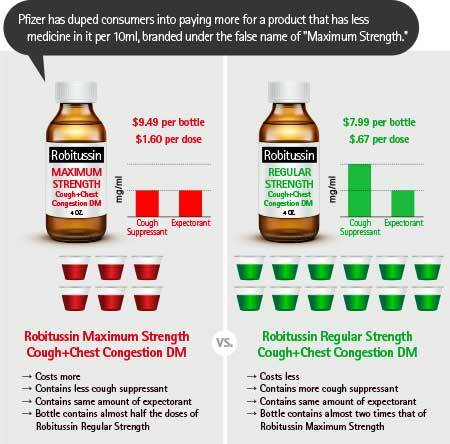 Purchasers of Maximum Strength Robitussin receive 10 mg of cough suppressant per 10 ml as compared to 20 mg per 10 ml in Regular Strength Robitussin and 200 mg of expectorant per 10 ml just like in the Regular Strength Robitussin. Based on the dosing recommendations, for the same-size four fluid ounce bottle, Maximum Strength Robitussin provides just 5.91 doses whereas Regular Strength Robitussin provides 11.8 doses. The difference in dose amount and amount of cough suppressant means consumers will buy the more expensive option more often. The lawsuit seeks reimbursement for the price pushed onto consumers due to Pfizer's false advertising. The lawsuit states, "By specifically naming Maximum Strength Robitussin with a plain-meaning efficacy claim, Pfizer intended that consumers believe that they would get more active ingredient than in the regular version of Robitussin." Hagens Berman believes that those who paid for the more expensive Maximum Strength version were outright taken advantage of. We believe Pfizer did this deliberately. Hagens Berman is one of the most successful consumer litigation law firms in the U.S. and has achieved more than $260 billion in settlements for consumers in lawsuits against food corporations, automakers, big banks and others. Your claims will be handled by attorneys experienced in consumer law.